Swellegent, that is! I mentioned the product in a post about the workshop I took with Christi Friesen last month. The Swellegent products are finely-ground metals suspended in a binder. They thin and clean up with water, which make them extremely easy to use, but because they are metal they can be oxidized or given a patina. I thought they would make nice accepts on giftware, as well as being useful for things like tack hardware and shoes on those ceramic pieces that have them. I ordered the Copper version to test, thinking that it might compliment the crackle glazes on these Clinky Classic Challenge Awards. 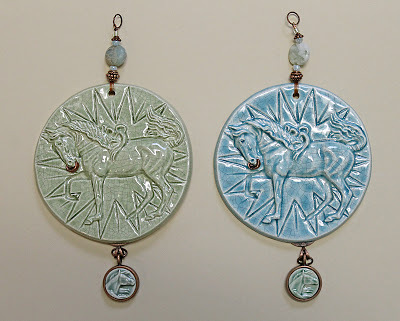 I added Copper on the cups being held by the horses right over the existing glaze, and then used the patina to darken it. As you can see, it matches the antique copper on the findings perfectly. The slick surface did make it a little more difficult to handle, and I was glad that I was only adding the metal to a small area. 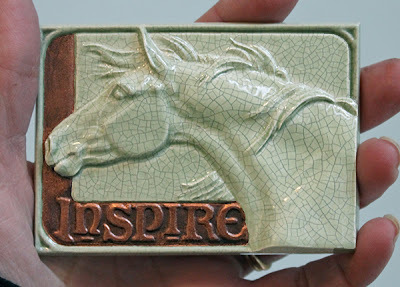 I decided to try another experiment with one of my own Inspire tiles, this time leaving the bare bisque where the metal coating needed to go. I really liked how the patina made the letters pop from the background, and it was much easier to get a smooth surface using the bare bisque. If leaving an area like the horseshoes on a figure is possible, I think that would be the way to go with this. 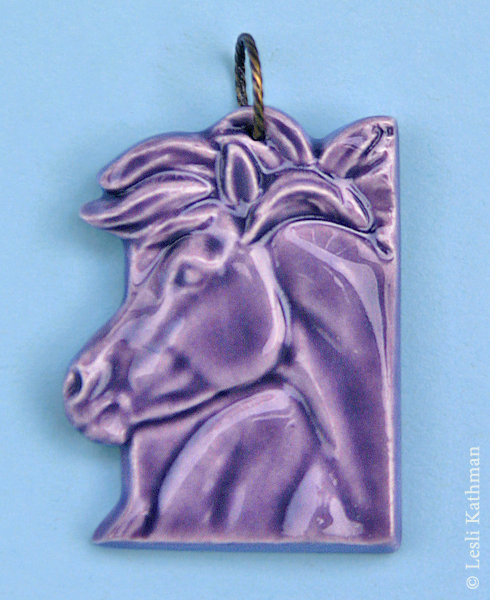 Overall I found the product much easier to use than fired-on lustres or even metallic paint. It does take a few days to fully cure, but I found that once it did it was pretty impervious to damage. The company does make a sealant, but even without it – and even on glaze – it did not flake off or scratch. My next test will be with to use the Iron on a horse with shoes, just to see how it holds up to that kind of handling. 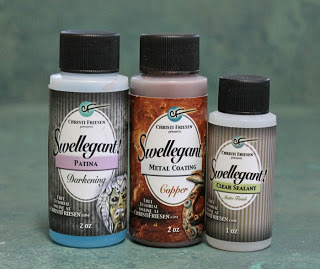 For anyone interested, you can order Swellegent from Christi at this link. It comes in Copper, Brass, Iron, and Silver, with each 2 oz. bottle $6.50. One bottle should last quite a while – I did several tiles with nothing more than the residue inside the lid. I have been working on some new giftware items the past few weeks, in between cleaning greenware and detailing some horses. 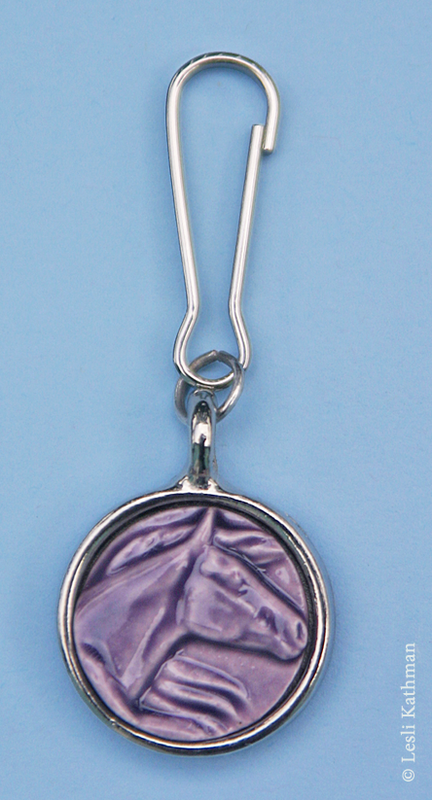 The first is the new pendant, shown here in my favorite purple art glaze wired from the top. The piece is designed so I can drill a hole for hanging at the top or one on each side, depending on how the necklace needs to be strung. This particular one has a twisted antique brass jump ring for the bail, but I’ve also experimented with wrapped wire bails, too. 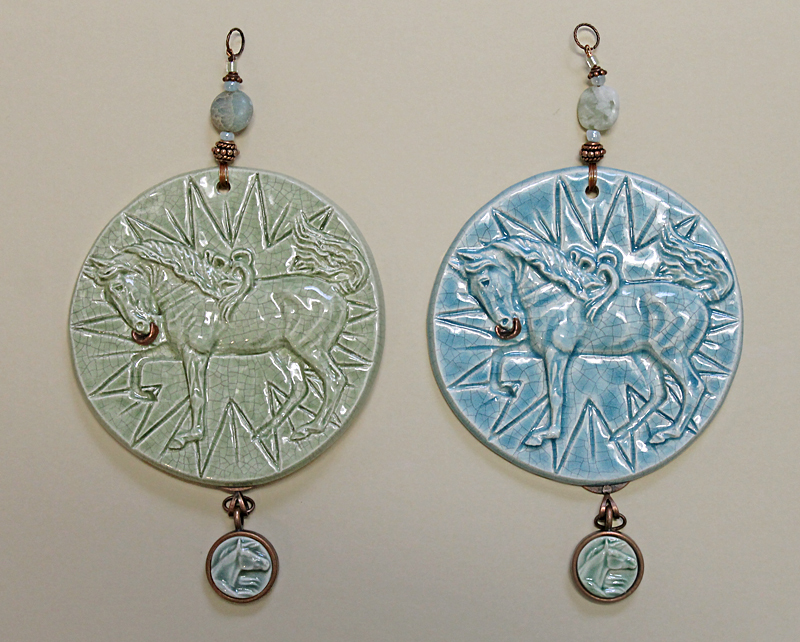 Those are fun because I can add a bead accent to them, as well as work with less common metal finishes. My second item is a zipper pull. I’ve taken the same cabochon that I’ve used with the bookmarks and trimmed it to fit inside a heavier setting. I thought these would work well as zipper pulls because the bead is almost entirely recessed, which makes it a little more sturdy. I have to admit I have yet to chip one of the unset cabochons, despite intentionally treating them carelessly, but it never hurts to have a little extra protection. 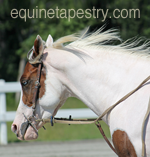 This is especially true when you hang around a pony that has an obession with zippers. This particular one has been hanging from my barn jacket for a few weeks now and is none the worse for wear, so I am considering it suitable for the task. I hope to add both items to the Etsy store in the next week.